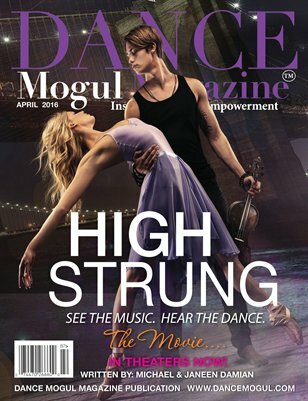 High Strung is inspired by Janeen’s experience when she was awarded a scholarship to Balanchine’s School of American Ballet in New York,” Michael confides. “So it’s basically her story, her adventures, and what it was like for her moving to NY from a small town; like we have Ruby, our lead character in the film, coming from the Midwest.” Michael and Janeen started music and dance at a very young age under the tutelage of their respective mothers. Michael’s mother is a classical pianist, and Janeen’s was the artistic director of a ballet company. “The fact that they introduced us to the arts when we were so young made a big impact on who we became as adults,” Janeen observes. “The love affair started way back then, and continues on today. This story is very personal for us.